Polterguys CH5-12-29 to CH6-1-14 are up! Click to read new pages. Chapter 6 begins and we find out Simon’s story. A quick reminder that the Six Seasons and a Movie art show will be this weekend June 23 and 24 at Monk Space in Los Angeles, CA. Above is the trailer for the documentary reward for backers of the art show’s Kickstarter campaign. Polterguys is a Xeric Grant 2012 Winner! 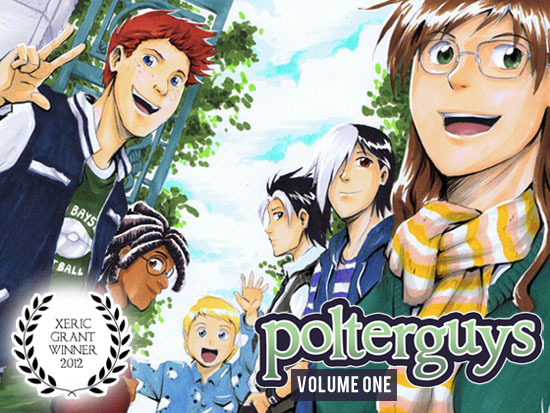 I am very pleased and humbled to announce that Polterguys Vol. 1 was awarded a $5,000 grant by the Xeric Foundation. We received a phone call on Friday afternoon and are awaiting the official letter by mail. Polterguys Vol. 1’s Kickstarter is live! Check out our book trailer and a short video featuring me (trying not to look nervous) above!